A sermon preached at Grace Episcopal Church, Alexandria VA on April 14, 2013. The texts for reflection were Revelation 5:11-14 and John 21:1-19. And even though we might be able to understand why they went back to their routine, they really have no excuse, no excuse for pulling up the anchor and heading back into the sea. For when they saw Jesus after his resurrection, it wasn’t like any other encounter they had before. They didn’t simply break bread and reminisce on that time he overturned the tables, or when he washed their feet, or even how he was put to death on a Roman tree. When they saw Jesus in that Upper Room, there mourning his death, they saw their Risen Lord, saw the wounds in his hands and the pierced side from which flowed the river of life…they saw him and there received the Holy Spirit. 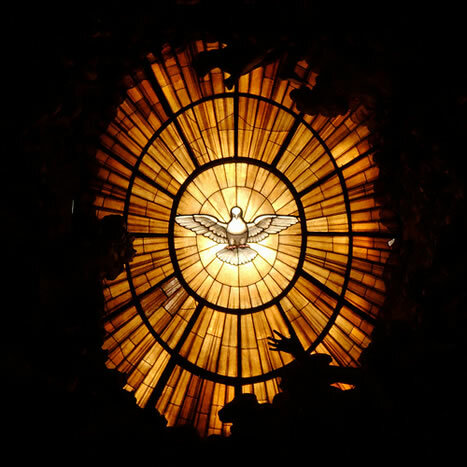 Somehow Jesus had made it through the locked door of that Upper Room, stood among them, and breathed on them the Holy Spirit. 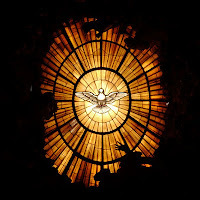 And if we know anything of the Holy Spirit from her appearance at the first Pentecost, the Spirit doesn’t leave things the same, isn’t satisfied with the mundane, isn’t content to flutter and float about to incite feelings of ecstasy. No, the Spirit comes to remind the disciples of everything Jesus has said, to grant them true peace, and to empower them to make disciples of all nations. The Spirit comes to overturn not just tables but the sickly sweet allure of the routine, of the old life, of the doldrums of the known and the comfortable. The Spirit comes to set the world ablaze with the passion of Jesus and the very power of God that raised him from the grave. And it is after receiving this uncontainable Spirit, receiving their marching orders anew, that the disciples floated out into the Sea of Tiberias to catch a few fish. True to form, the disciples are as obtuse as ever, seemingly missing the point of Jesus even bothering to burst forth from that tomb and breathe on them a fresh wind of the Spirit. If we’re going to be gracious, perhaps they just didn’t know how to make sense of the Resurrection, and so the comfort of the catch allowed them some space to think, to reflect. Perhaps it’s because they are like every other human throughout history: we are scared and frightened when we encounter what’s truly Real, when we encounter the Radical Otherness of God…we are so scared and frightened of the implications of following the uncontainable Jesus that we slip back into the day-to-day reality we’re used to. Speaking from my own experience, I’m confident I would be right there with them, sitting on the deck of a boat with a coarse net in my hand, trying to make sense of all that’s happened. We know the disciples dreamed of the kingdom, dreamed of Israel’s messiah liberating them from oppression and ushering in the promised Reign of God. We know this was their dream, their fantasy even. But when they encountered what they dreamed of for so long, they slipped back into the reality they knew all too well. A philosopher I admire once said, with his typical flair for the provocative, “It is not that dreams are for those who cannot endure reality, reality itself is for those who cannot endure their dreams.” And I’m convinced this is true of the disciples, perhaps true of some of us today. Reality for them, the reality they knew before being summoned to serve the Messiah, was a way for them to escape the ‘dream-come-true’ of Jesus’ Resurrection, and the strangeness and incomprehensibility of that miraculous act of God. Reality, with its predictability, allowed them respite from the cross, the grave, and that unbelievable scene in the Upper room. As I said, the disciples were true to form, true to their obtuseness. But thankfully, Jesus was true to form as well…true to his grace, graciousness, and hospitality. The disciples went back to shore, empty handed. Perhaps their hearts weren’t in their first trip out to sea. Perhaps the currents kept the fish from their nets. For whatever reason, these seasoned fishermen came up short. Hungry, tired, wearied, they stood on the shore with nothing to show for their efforts. But next to them stood Jesus, his appearance different than before, unrecognizable even. “Children, you have no fish, have you?” I can just imagine the disciples, frustrated by their empty hands, even more frustrated by this almost humiliating question. Then a command: “Cast the net to the right side of the boat, and you will find some.” And for whatever reason, they listened. Throwing their nets to the right side, immediately they knew something was different. Immediately they knew that, in the midst of the mundane, magic was happening. So many fish, 153 of them, flowed into their nets. And right then and there, they knew. 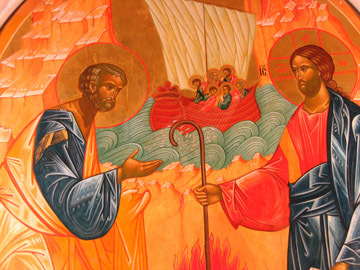 “It is the Lord.” They sailed back to shore, Peter rushing ahead, impetuous as he always is. And what’s the scene they find? Why, their Lord and their God cooking breakfast. Burning coals, roasting fish, and fresh bread. The man who died and rose again setting the table for fellowship. A bidding: “Come and have breakfast.” True to form, Jesus was gracious and hospitable, but his graciousness and hospitality, as always, has a way of disrupting the mundane and the routine of the familiar. It’s interesting that Jesus doesn’t berate them for returning to their nets, having dropped them on the shore three years ago when he first summoned them. He just sits with them, loving them through the simple act of cooking. And this simple act of cooking becomes something so redemptive, and I can only hope to have an encounter like this myself. Whatever Peter desired the night before when he cast his nets into the sea and came up empty-handed, none of that mattered. However misguided the disciples were in returning to their former lives, none of that mattered. That’s the beauty of Jesus. Forgiveness is offered time and time again. Out of the mundane, another miracle occurs. Redemption. Rehabilitation. A fresh move of the Spirit to inspire and enlighten the hearts of those disciples on the shore. I said before that we aren’t much different than the disciples. We all have moments where we return to the reality of the old ways, to the routine that gives comfort even as we are aware of a better way, a holier way, a more transformative way. So how can we, those reflecting on this exchange, cope with our own tendency to desire things other than the revolutionary love of the Spirit? Perhaps that’s a question answered by Jesus’ graciousness towards Peter. On the night Jesus was betrayed, three times Peter denied Jesus, his desire to remain safe and unaffiliated overcoming his desire to follow Jesus to the cross. 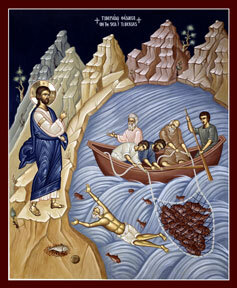 But in spite of his failings, three times on the shore Jesus commissioned Peter to feed his sheep. But each commission was coupled with the question, “Do you love me?” And each time Peter answered “Yes”, and he even became upset that Jesus would ask the question three times. But what we miss in the English, however, unlocks the power of this passage. Two times Jesus asks Peter, “Do you love me” he uses the word agape, the strongest of the three Greek words for love. This is the love God has towards us. This is the love shared within the Triune Godhead. This is passionate, transformative, redemptive love...the love of that Spirit breathed on the disciples in the Upper Room. But Peter can only muster the strength to use the word phileo, which is a weaker word for love reflecting something like friendship, or ‘brotherly love’. Jesus asks him if he burns with the flame of agape but Peter can only offer the nearly snuffed out coal of phileo. But the third time Jesus asks the question, “Do you love me”, he doesn’t use agape. Jesus himself asks, “Do you phileo me.” Jesus is keenly aware that Peter is a weak man, not at the point in his life where he can burn with agape. Jesus knows the weakness of Peter, but instead of casting him away, Jesus takes whatever love Peter can muster, no matter how unrevolutionary or untransformative it is, and uses it to commission Peter once again to feed the sheep. So my friends, standing before the table set for us, a common, mundane meal made miraculous by the presence of Christ, Jesus is asking us the very same question, “Do you love me?” And my prayer for us all during this Eastertide is that we will answer Christ’s call to feed his sheep, no matter how attractive our old mundane life seems. Let the Resurrection over take you, making monotony become magic, and the mundane acts of your life become occasions to ‘haul in’ a harvest greater than you could have ever imagined. Let your dreams of the Kingdom not be something you flee, back to ‘reality’ as it were. Let the Resurrection convince you that the Kingdom Come already is our reality, and the only thing left to dream of is an opportunity to cast your net to the right side, and haul in the bounty Jesus has laid before you. Will you answer his call to love him truly? Will you answer his call to feed his sheep? Will you answer his call to give up your life, and to follow him?